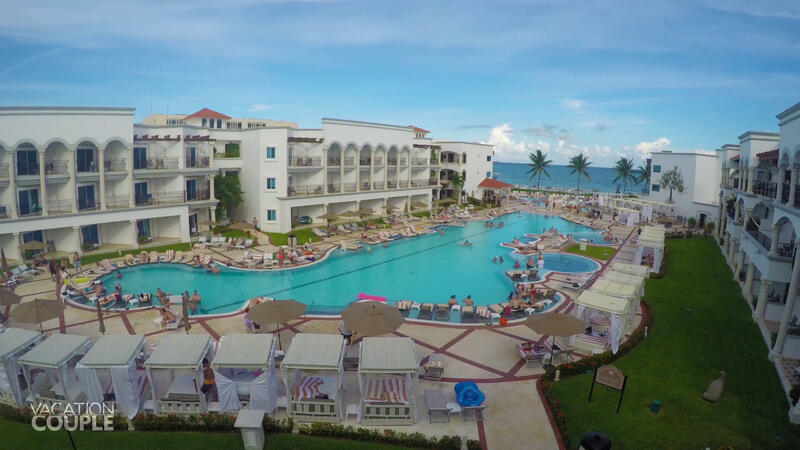 Each of these all-inclusive resorts in Mexico impressed us with their locations, service, food, and activities. At each family resort mentioned in this article, there is an adults-only area or adjacent adults-only resort. If you’re looking for a child-free environment then check out the Top Adults-Only Resorts in Mexico. We decided our top 5 favorite resorts for 2017 using a few different, very important, vacation variables. 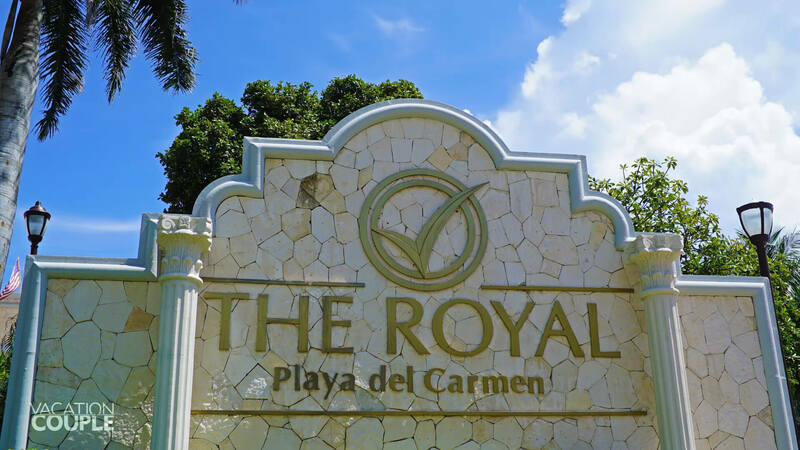 Focusing on romance, luxury service, the food, pools, the beach, amenities and our overall experience, we debated for many nights until coming to the following conclusions. 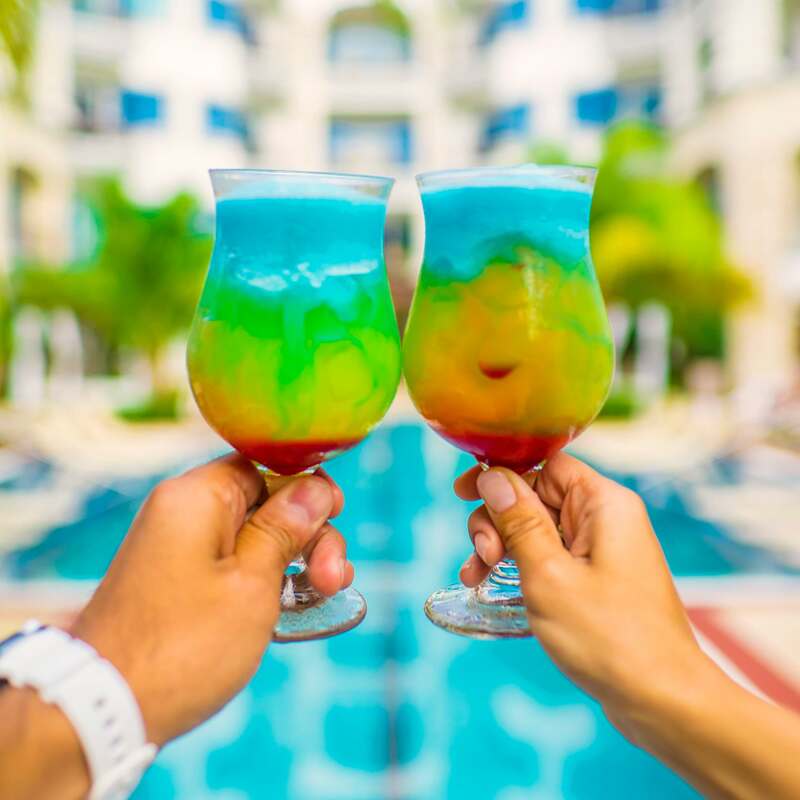 This resort has a prime spot on the beach and is steps away from the famous 5th Ave. Each room has a balcony, a hammock, pillow menu, liquor cabinet, and a two person jet tub. There are unique varieties of room options with walk out cabanas, swim-up suites or a lovely garden view. We loved the nightly shows in the lobby, their Olympic size swimming pool, as well as all the romantic possibilities. See a tour of our room here. 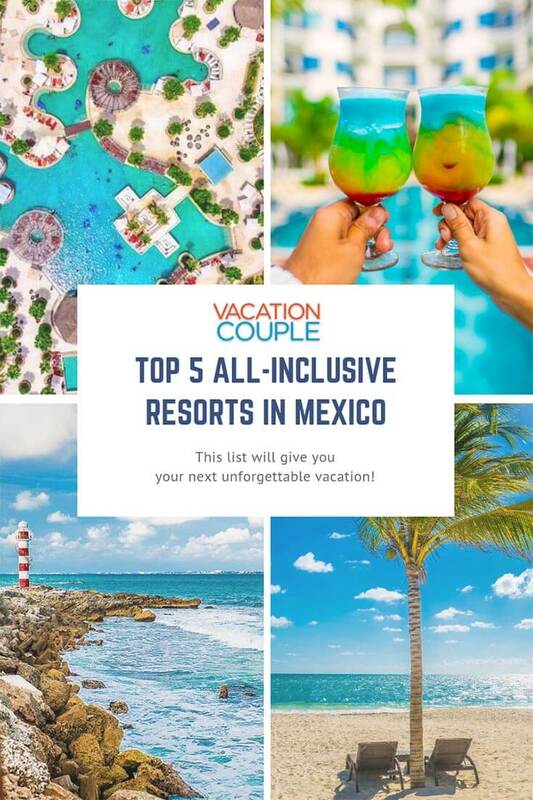 They are setting the bar high for all-inclusive resorts in Mexico. This NEW property recently opened on November 30th, 2016 and we were honored to be the first guests to attend this incredible family resort. With 65, 000 square feet of pools, including a waterpark, two waterslides, two infinity pools, a children’s pool and a lazy river, you’ll have your choice of endless places to cool off. They have an Explorer’s Club for Kids with supervised day and evening activities. In addition, they have a Core Zone Teen Club with teenager-oriented activities. Some kids activities include a playground, arts & crafts, board games, treasure hunts, sandcastle contests, kids’ theater, big screen movies and weekly campout adventures. Parents also have access to beepers for optimal communication. Some teen activities include a climbing wall, batting cage, foam parties, non-alcoholic drink & snack bar, access to Xbox 360® and PlayStation 2®, and an arcade. Truly, it was the most unique and had the most variety of activities for kids and teens that we’ve ever seen! 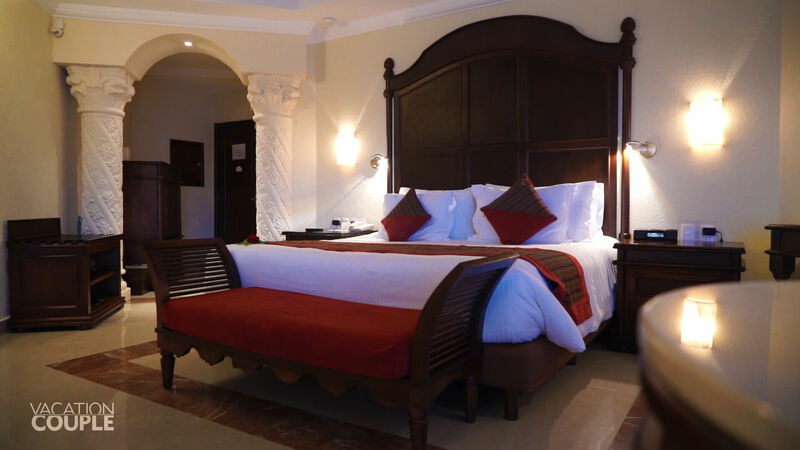 They have family-friendly accommodations with suites that can accommodate a family of 5 as well as connecting rooms that can sleep up to 9 people. For a more in-depth look, you can watch a tour of our Master Suite Ocean View Swim-Out Room. You can even slip away from the kids and head over to the Greg Norman designed, Dreams Playa Mujeres golf course for a quick round of golf. As a guest, you have complimentary greens fees and roundtrip transportation here, it’s a fun 5-minute drive over on a golf cart. 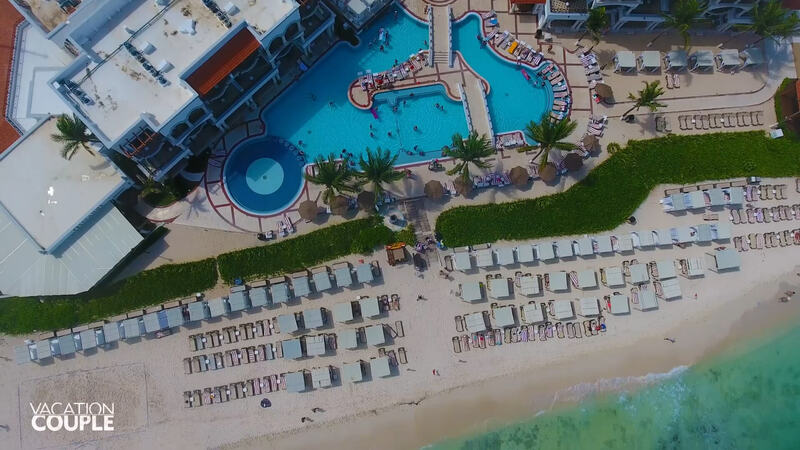 Adults also have access to the adults-only Secrets Playa Mujeres Golf and Spa Resort facilities just steps away. This includes their spa services, gym, entertainment, restaurants, bars, beach, and pools. 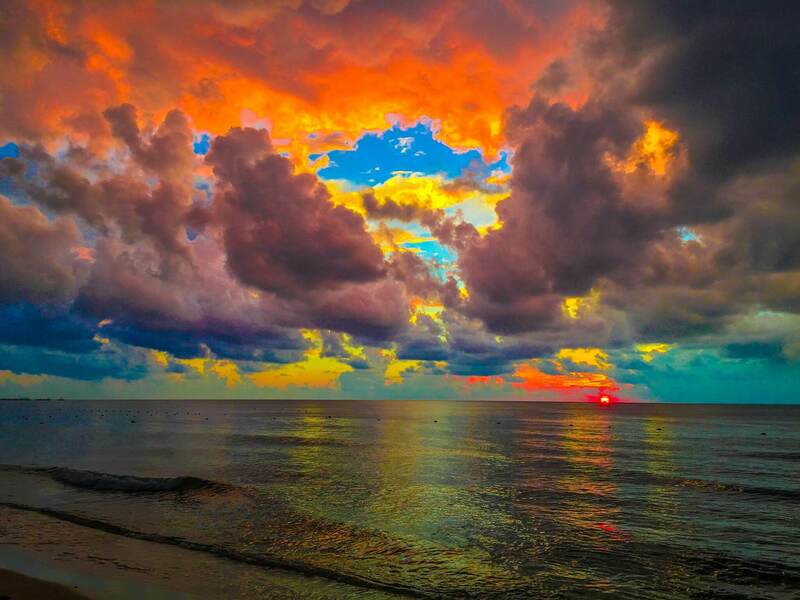 Found on a beautiful strip of beach facing the Caribbean sea, you’ll always have the perfect spot to watch the sunrise here. There are four different main pool areas, with one being specifically for children. The children’s waterpark boasts a splash pad, and both mini and mid-sized waterslides for kids of all ages. For children 4-12 years old they have a Kids Adventure program, Clubhouse Kids Club including performances and activities with Max & RubyTM, including access to the playground and lots of games. They also have a Hangout Teens Club for children ages 13-17 years old with games, a Playstation rooms, charging stations and ping pong tables. We enjoyed an excursion with Nexus tours on a catamaran and had an unbelievable time getting our dose of vitamin sea that day. With unlimited drinks and our choice of music, we felt on top of the world as we partied the afternoon away! The areas that impressed us the most had to be the gazebo and the sky terrace for wedding ceremonies. It had unbelievable views of the water, modern and simple touches to the decor, and the perfect romantic mood. Our favorite meal with during the C/X culinary experience located in the Hideaway, adults-only section of the resort. We had a multi-course meal with the perfect wine, beer, and spirit pairings. It was truly a special night as each plate came out our jaws dropped lower. Having a sought after location on the strip, this resort is surrounded on three sides of the Caribbean sea. They have the Kidz club for children aged 4-12 years. This includes supervised activities, a children’s pool, and water play area as well as water activities. There’s ‘family time’ here for younger children accompanied by their parents at specific times throughout the day. You can go to Habanero’s for a nice lunch on the beach. Or dine in the blue Chevy at Chevy’s Diner and go back in time. One unique food option is the food carts that frequent the pool area. Some of the food cart treats included hamburger’s, watermelon, and mangos with chili, YUM! 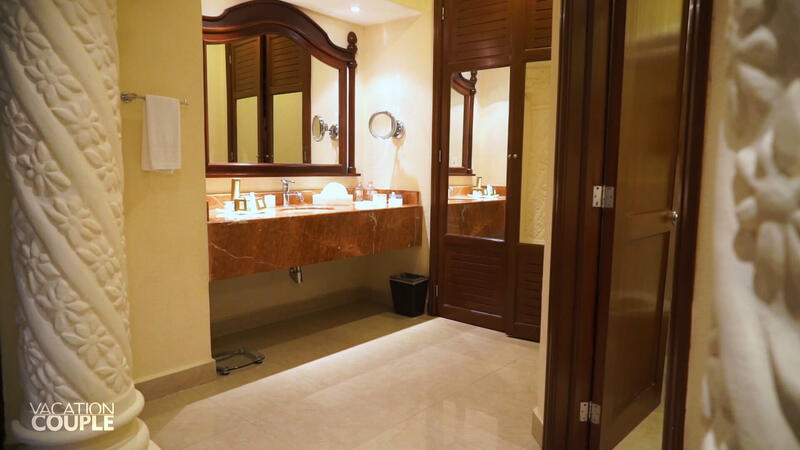 We’ve only experienced this unique feature at Hyatt Ziva all-inclusive resorts. There’s a gorgeous view from the adults-only turquoise club rooftop infinity pool. And it has some fun peeking panels to the lobby underneath. And while you’re up there be sure to enjoy a drink at the bar. They have their very own microbrewery & brewmaster, creating three unique flavors to showcase each month. My favorite was the IPA and Shadi loved ALL of them. And finally, they have their very own candy store. Pasteles candy shop has cotton candy, three chocolate fountains, endless plates of goodies and a lot more. They care about satisfying your sweet tooth! Located in a gated community, this eco-chic resort has thoughtful features like no other. The gorgeous infinity pools have an incredible view of the Caribbean sea. They have incredible themed parties with endless entertainment, food, and fun. I rode the mechanical bull, ate as many nachos possible and enjoyed the dancers, musicians, and singers performing. The pool bar is always pumped and the entertainment team was always smiling, in some cases hilarious, and helpful. The free water activities on the beach were handy and fun. We even sailed the sea on a hobie cat one afternoon during our stay. 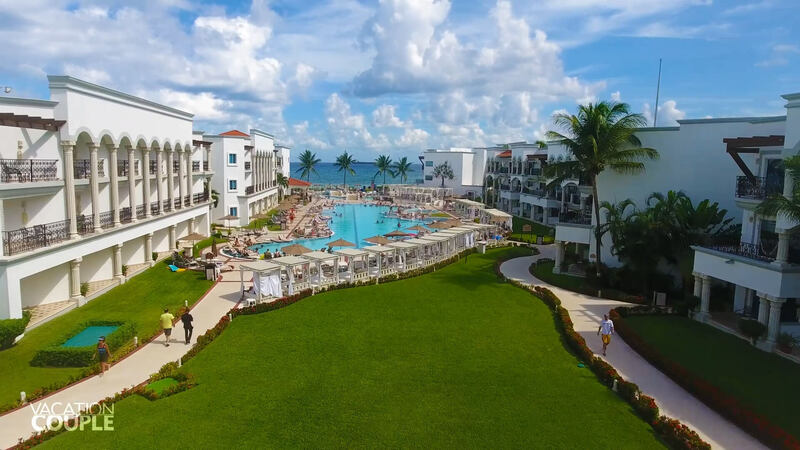 And a new feature that we love is access to the all-inclusive, family resort Dreams Playa Mujeres next door. Dreams have 65, 000 square feet of pools, a waterpark, waterslides, a lazy river (for preferred guests). And for families they have, kids club and teens club with rock climbing wall, batting cage, a non-alcoholic bar and so much more! As far as all-inclusive resorts go, visit one of these to vacation in paradise.